I suffer fairly badly from painfully cold hands when kayaking in cold conditions and so for me to paddle in the UK in winter I need some form of protection from the cold. There are various items available, from gloves and mitts to pogies. I have tried numerous versions of them all but the ones that work best for me are neoprene pogies. The ones that I use are the Palm Neo mitts. They have several features which make them stand out from the others. The Neo mitt is a full length pogie made from 3 mm neoprene with a thermofibre lining. It attaches to your paddle with Velcro and protects your hands from the cold. It has a wide cuff for easy entry and a pull tab to help put it on. As with all pogies it keeps your hands warmer than gloves and it lets you feel the paddle shaft. 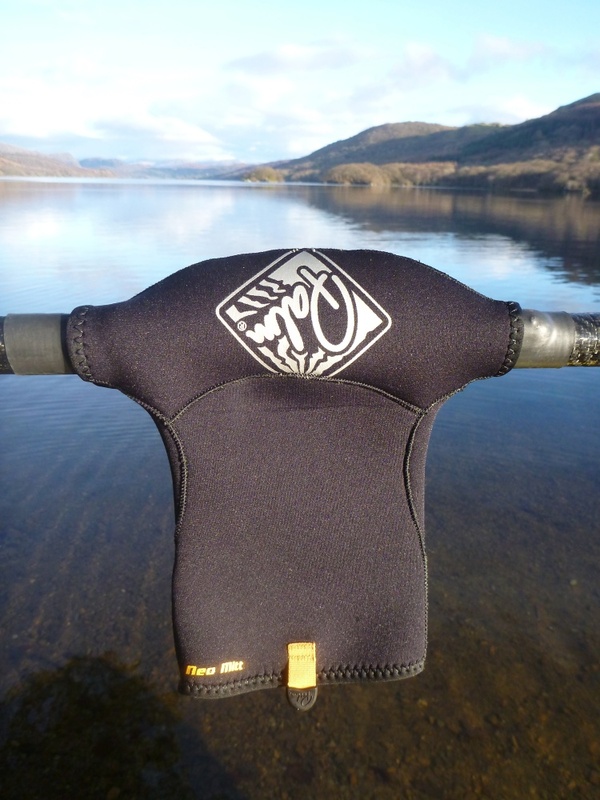 Compared to other neoprene pogies they are quite thin which for me is a real benefit as the weight can affect you paddling. Most noticeably when you try to increase your paddle rate to say catch a wave, the extra weight can slow you down. Palm have managed to keep them thin and warm by using their thermofibre lining which not only adds to the warmth but also reduces the painful rubbing that unlined neoprene can cause. 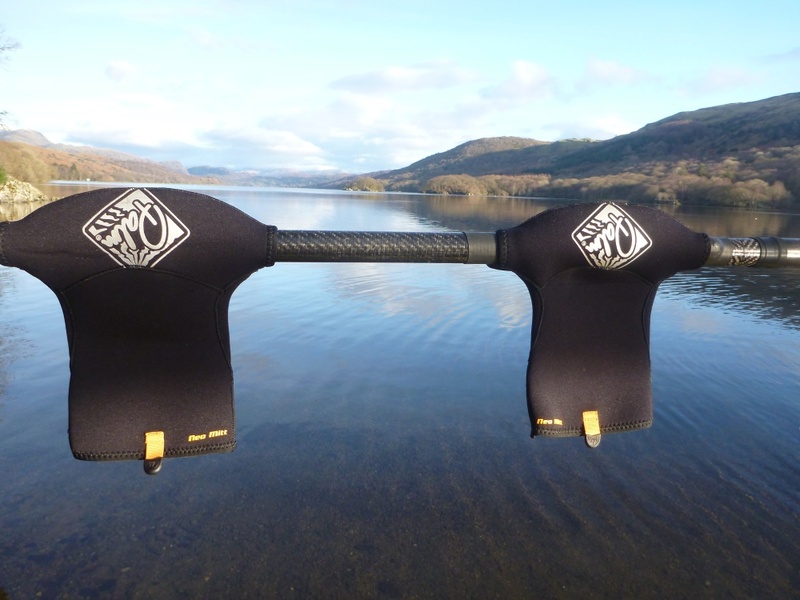 This has the benefit of letting you paddle with a nice relaxed grip which is much better for your paddling than the normal clenched grip you tend to use with other neoprene pogies to prevent rubbing sores on your hands. The pogies also benefit from being able to be used in a few of different ways. If it isn’t too cold you can roll the top of the pogies down so that you can very quickly get your hands in and out which can be very useful for say taking photos. This also vents the pogies well letting your hands breath and not get too soft from being sweaty all day. If it’s colder you can unroll them which makes them seal well against your dry top cuffs keeping your hands nice and warm and most of the water out. And if it all gets a bit to much and you need your hands free for a while you can push them into the middle of your paddle shaft and carry on unencumbered. Here’s to a good winter of paddling. Anglesey, Wales. You’ll find Phil in his sea kayak, surfing the endless waves of the outer race at Anglesey’s South Stack. Famed for its countless swirling currents, cliffs, caves, wildlife and a feeling of seclusion, Anglesey is a natural choice of home for the adventurous sea paddler, and the perfect spot for Phil. When not out throwing impressively large pop-outs, and generally treating his sea kayak as a playboat Phil’s other passion is for coaching, as a way of passing on his enthusiasm, and generally sharing the love for paddling.